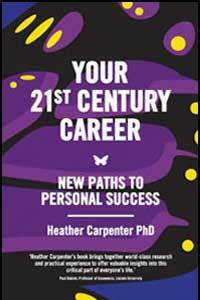 This book will help you get into work that suits you, and offer ways to keep yourself current, resilient, in touch with your career progress, as well as connected to your values and the way you want to live your life. This is the career of the 21st century, and no matter your age and stage of life, there are learnings that can help you develop a happier and more satisfying career; simple understandings and strategies that allow you to find the path you want and work in a way that better suits you. Allison Fisher, Career & Life Coaching.